The analysts at IDC have done yet another smartphone market forecast, trying to predict the development of the smartphone race over the next five years. The numbers are substantially different from last time, which shows that the very idea of trying to make long-term predictions for such a dynamic market is not too great, but obviously they are not giving up. Here's IDC's table showing how they think the smartphone market will evolve by 2016. 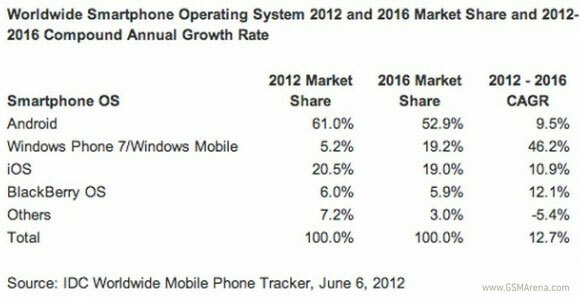 Last year IDC reckoned Windows Phone 7 will boast 20.9 percent market share in 2015 and will surpass iOS, which in comparison will have only 15.3 percent market share. A year later, WP is seemingly further away from the second spot with predictions for 2016 putting it just 0.2 percent points ahead of iOS. What's even more puzzling is that, according to IDC, the currently dominating Android and iOS platform will be unable to keep up with the market growth and will let their market shares slip. BlackBerry on the other hand will keep pace and will retain their current position. Given that iOS and Android are the main driving force behind the smartphone growth in the past few years, it's hard to see any of those predictions coming true, but who knows - as we said making forecasts on a market as dynamic as this involves more guesswork than actual science. Underpinning the smartphone market is the constantly shifting OS landscape. Android will maintain leadership throughout our forecast, while others will gain more mobile operator partnerships (Apple) or currently find themselves in the midst of a major transition (BlackBerry and Windows Phone/Windows Mobile). What remains to be seen is how these different operating systems – as well as others – will define and shape the user experience beyond what we see today in order to attract new customers and encourage replacements. These old comments are gold. Well here we are in 2016 and WP is nearly non-existent, lol.